Whether you are newly diagnosed or a veteran in your health condition, there are always opportunities to learn, share, and create a group of trusted peers who become your tribe. Despite a diagnosis of type 1 diabetes over 30 years ago, it wasn’t until I recently “found” my tribe that I truly understood the life-changing positive benefits of partnering with peers — those who travel along a similar healthcare journey. How did I find my tribe? I created it, using many of the Partnership Principles. In a quest to better understand diabetes and how to manage it, I attended conferences and meetings where experts would stand up and discuss research and treatment plans. These sessions were helpful, but what shocked me was where I truly learned to understand daily life with my disease: my peers, during rapid-fire discussions in hallways or sitting around a lunch table. We began to talk beyond the medical management and focused on how to “live” with diabetes. I realized that there was something missing that was needed in our community: a patient-led psychosocial idea exchange where we could share our fears, frustrations, and tips in a safe, protective environment where no one felt judged or criticized. The Diabetes UnConference was born. I couldn’t do this alone. I asked for help from a group of people impacted by diabetes who I trusted: my peers. Those whose wisdom I sought out and those I admired for their ability to be honest and supportive became the facilitators for sessions discussing intimacy issues and burnout. They helped others share their secrets by creating a sacred space where social media was not allowed to penetrate. Our peers are our experts and by acting as partners, we have the opportunity to switch roles during discussion. Part of our commitment to each other during the conference is to check in frequently with these questions: “Do you feel welcomed? Do you feel valued? 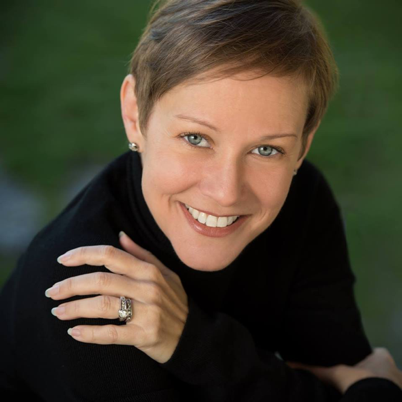 Do you feel respected?” Many of the conversations that occur during sessions are deeply personal and even if we have different attitudes or treatment plans, the overarching goal is to learn from each other. We have had attendees diagnosed in the past six months sitting next to peers diagnosed over 50 years ago — and each said they had learned something new and were able to find a connection, because they vowed to respect their individual experiences. I value the communication between my peers during The Diabetes UnConference, because in listening to others and being able to openly share my experiences, I have learned new ways to manage daily life with diabetes. While I may not utilize a particular treatment, learning about it from my peers is crucial, because I never know who I might meet in the future who is interested in that particular issue. Connecting and communicating with others widens my partnership with my peers through listening. Many of our attendees say that because of what they learned at The Diabetes UnConference, they have made positive changes to their daily management and have achieved measurable positive outcomes. I’m one of those peers. In addition, by listening to the feedback my peers gave me from the first conference, we have evolved. One attendee said that they wished those who love us — spouses, significant others, parents, children — were able to have the same type of psychosocial support and safe, non-judgmental environment. Many other peers agreed, and the next year, we created that space for a new group of peers: PLUs (People who Love Us). Partnering with my peers allowed us to grow and welcome more partnerships that didn’t exist before. As The Diabetes UnConference matures, I have found my tribe and helped to grow partnerships that have turned peers into trusted confidants and friends. Many attendees check in with each other on a regular basis, despite living across the country. My peers and I are looking to expand ways to have those trusted face-to-face conversations in a safe environment to others who can’t attend a conference due to location or financial constraints. We are looking for what’s missing and finding ways to fill that gap. My experience with founding The Diabetes UnConference has me wondering how many other health conditions could benefit from this type of psychosocial idea exchange and how others could partner with their peers. 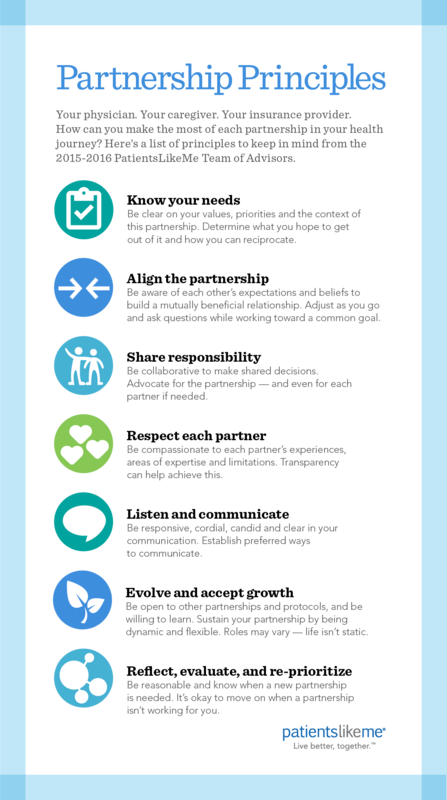 Using these Partnership Principles offered up by the PatientsLikeMe Team of Advisors is a great place to begin.